From left, East Ridge coach Doug Long, Woodbury coach Wes Bolin and Mounds View coach Rick Thomas at the Suburban East Conference's Hockey Day on Jan. 14. 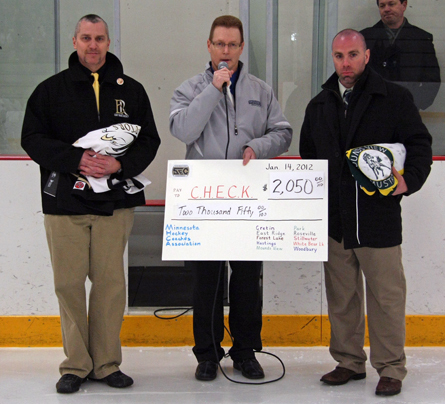 The Suburban East Conference boys hockey coaches raised $10,249 to support the cause of eliminating cancer in kids and helping families who are effected by childhood cancer. This year’s Coaches Helping Eliminate Cancer in Kids event involved was held in conjunction with the Suburban East Conference Boys Hockey Day on Jan. 14 at Cottage Grove Ice Arena. All ten conference teams played each other during the league's Hockey Day, with each school challenging its opposition that day to raise money for this program. Each school that raised the most money saw the opposing team's head coach wear the opposition's jersey during the first period of their game. Funds were collected during school and at games from Jan. 3-14. The winners were announced just before the start of each varsity game on Jan. 14.